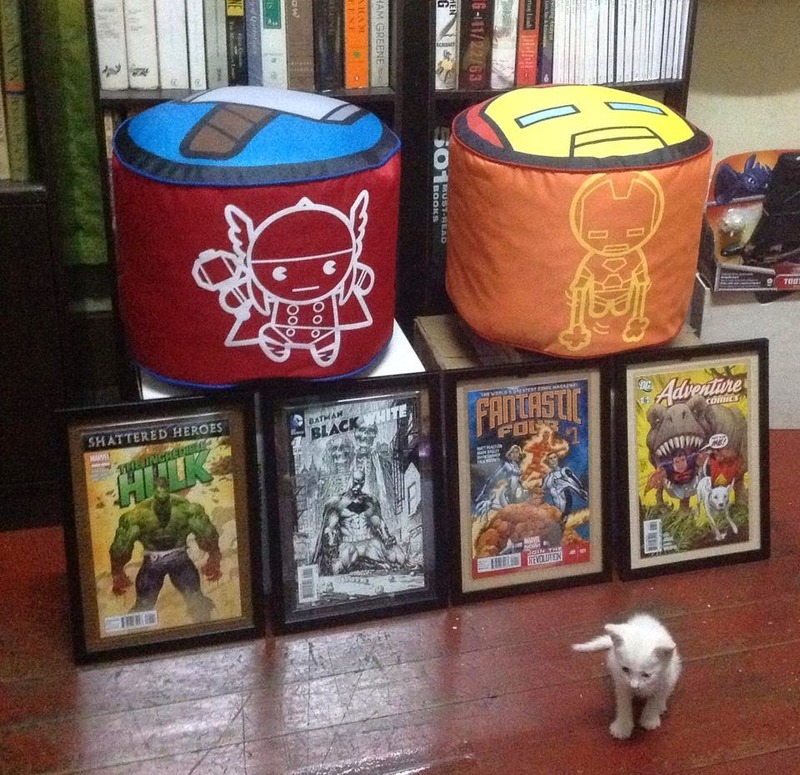 Shown here are four framed comics, two Marvel superhero plush seats, and a small, white foundling -- all recent additions to the Project 8 house at the end of the street. Now we have a small problem which, luckily, you, dear friends, can easily join in solving: I have run out of walls to hang my frames (and more are scheduled to be added soon), so the happy solution is to buy a big, new house with many rooms to hang frames, to scatter cushions and seats around, and to board cute kittens and bigger cats (about 20+), and dogs (4), and four humans (us). 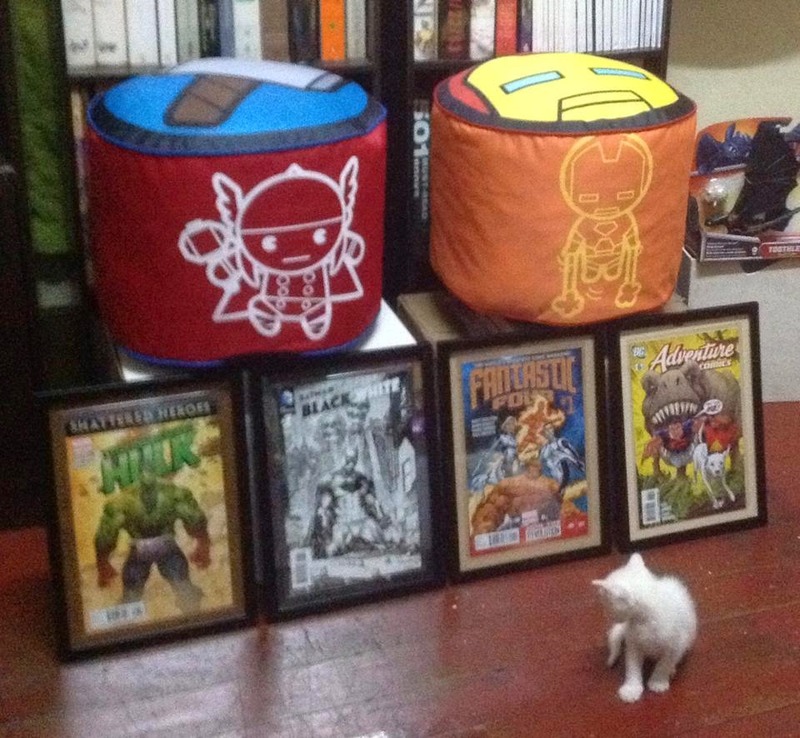 I have turned to the real estate ads: there are big houses available but they are not fit for the artistic integrity of the comics and insufficient to carry the cuteness of pets. However, I finally found one, which the splendid gate alone will get inked thumbs of approval from Curt Swan, Jim Lee, or Marc Silvestri. The only hitch is the house is at the high end; ah, sort of expensive, say P7,025,004.25. I have the P25,004.25; all I need now is the P7,000,000, which can easily be procured by the generosity of Facebook friends. Acquaintances are also very welcome to participate in my inspired idea; those I have unfriended or blocked I can befriend or unblock so they can send their share -- a half million here, a quarter of a million there, even small amounts can add up, so don't be ashamed of your offer. There are some who ask about repayment . Now, that's a thought; interesting too. Sogo, my assistant, says "Yes of course." I fully agree: we pay back the donations from our Lotto jackpot winning, from which we can buy a second and colossal house for the thousands of comics, posters, superhero toys and cushions to be added. A brief explanation: Entering politics came into mind, but after Drilon assured the public that there will be no PDAF next year for senators and representathieves, the idea quickly bounced out of consideration. Besides, winning the Lotto is not so difficult. I even came out with an effective way to win: (1) First, I must bet. Sogo has pointed out that the main reason I don't win is I refuse to part with my P20. From now on I will spend P20 daily toward repaying the P7,000,000 donations from my FB friends, acquaintances, ex-unfriend, and unblocked creatures of the swamp. (2) Don't change the combination of your numbers; faithfully bet on the same six numbers until I win. Statistically I have a many-many-million-to-one chance of getting the jackpot, but hey!, we can wait, can't we? So there we are, a happy solution for all! Cash is best, but I'll accept check, credit card allotment, Lhuiller remittances, blue-chip stocks, pledges, even inheritance. Please, no cp loads. I can't consume or convert millions of pesos of loads into cash. With a sunny disposition and an optimistic mindset, I eagerly await the money that will pour in. The excess I will donate to PAWS, other animal centers, and charity. 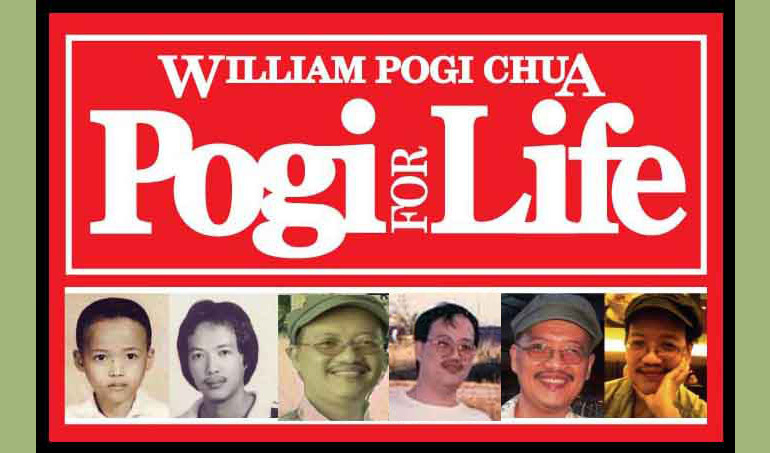 The first sender of P1 million donation will receive a big "Thank you!" from me. Hurry! I might change my mind.